After a breakfast of fruit and homemade granola we drove to Nahal Yehudia off highway <87>. 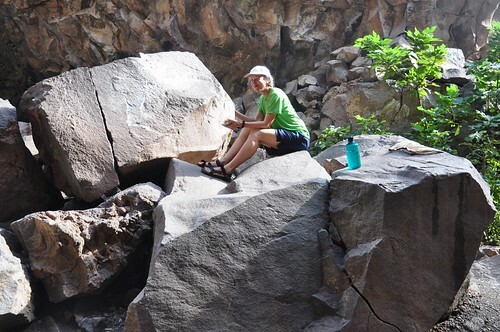 The hike is listed as appropriate for good hikers who can swim as there are a couple of places where you have to climb down the rock face with the help of handholds or a ladder into a deep pool that you have to swim across. 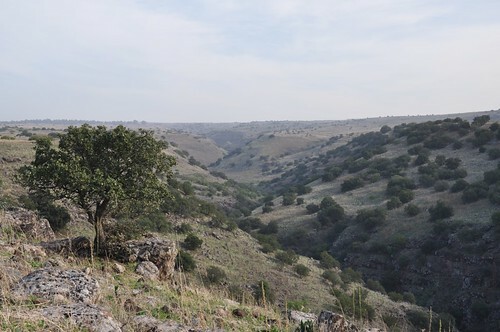 The trail is one of eleven listed in the Park’s brochure on the Yehudia Forest Reserve, including Nahal Zavitan, the Meshushim (hexagonal basalt pillars) pool and Gamla which includes the archaeological remains of the Jewish town that fought against Vespasian at the start of the Jewish Revolt in 66CE and Griffon vultures that can be seen flying overhead. There is parking, bathrooms, drinking water, a snack bar and information center (the park warden we spoke to was very helpful); the entrance fee was 20 NIS per person. Note that you must start out on the trail by noon. The hike starts above the wadi, walking through a deserted Syrian village built on the remains of an earlier Jewish one of basalt field stones from the Roman-Byzantine period. Remains of a wall have led archaeologists to suggest that Yehudia is Soganey, one of the three fortresses (the other two are Gamla and Sele’ukya) in the Golan built by Josephus at the time of the Roman Revolt. You walk on a path strewn with basalt, by pasture land where you may see cattle grazing. 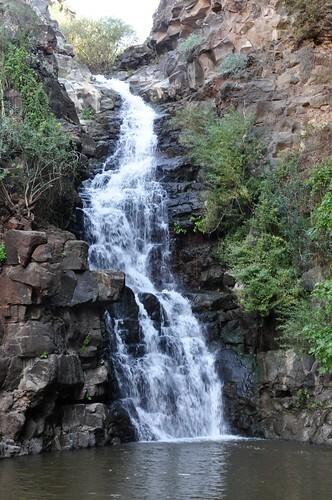 Then you walk down into the wadi to the Yehudia Falls and the first pool, good for a cool dip especially if it’s a hot day. At this point we changed out of our hiking boots and into water sandals as there are places where you walk in the water. Continuing along the wadi you get to the first descent. U-shaped handholds have been attached to the rock to help you get down about 4 meters. This is just your warm up. 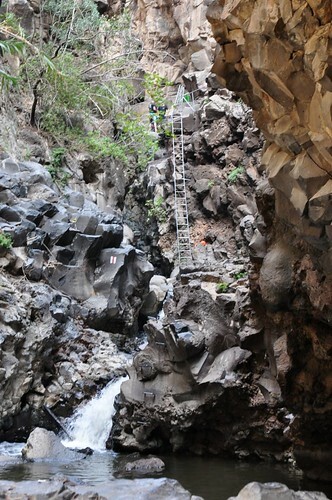 The trail brings you to a cliff where you descend 9 meters by metal ladder into a pool. There is no place to stand, you step off the bottom rung of the ladder and swim across to the other side of the pool. The challenge is what to do to keep your gear dry (and in this day and age with cell phones, cameras, car keys with electronic locks, etc. we have stuff that won’t work if it gets wet). We used the double garbage bag technique but also saw a group float their packs across on a small inflatable boat, you can rig up a rope and omega your pack across or probably safest, pack in professional waterproof bags used for kayaking. After traversing the pool you come to another descent, this time about 4 meters with only handholds. At the bottom you have the option of swimming or walking across the pool as it isn’t that deep. Be careful as it is slippery walking on the rocks. The water can be quite cold so it’s great that there is a place in the sun to sit on some large rocks and have a snack. Using the 2 large plastic bags that we had brought for our packs, we picked up a bunch of garbage that we carried out with us. We continued along the wadi, sometimes walking on the rocks, sometimes in the water. At the well marked junction you can leave the red trail to take the green back to the Syrian village or continue along the wadi a bit further to one last pool and waterfall. Then we backtracked and took the green trail up out of the wadi, back to the Syrian village and the trail head. It was just the middle of November but there were already cyclamen and narcissus in bloom. This entry was posted in Hiking, Itinerary, Nature, Water and tagged hike, Hiking on November 12, 2009 by Shmuel Browns. I’ve received a number of emails from people inquiring about hiking Nahal Yehudia. One good reason to hire a guide is that a guide is knowledgeable and up-to-date. 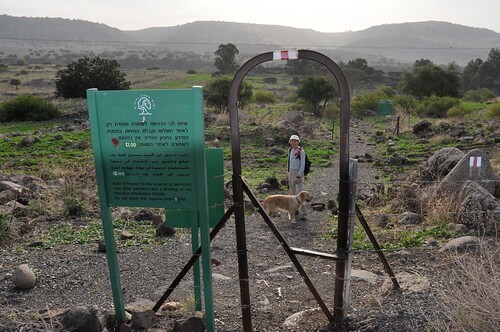 The Parks authority have reopened access to Nahal Yehudia, a 3 km trail, shorter than before. Talk to one of the park wardens if you’re planning to hike it.